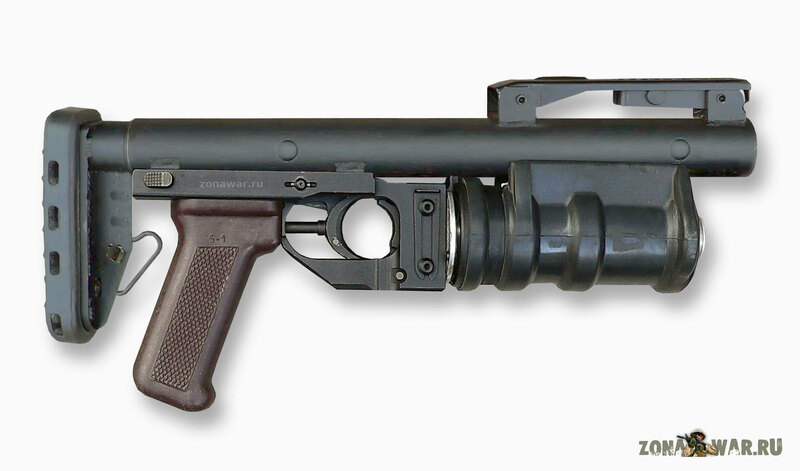 The RGM Kastet light grenade launcher is designed to disable human targets temporarily with tear gas, shock or other non-lethal ammunition, as well as engage adversary's manpower in trenches and on reverse slopes of hills with the VOG-25 and VOG-25P fragmentation rounds by flat or curved trajectory fire. The weapon can also be used to engage other unarmored targets beyond the reach of small arms. The Kastet light grenade launcher features a self-cocking trigger mechanism and a tanaent back-siaht mechanism, which makes It possible to allow for the grenade drift. The grenade launcher has a telescopic stock. The weapon is loaded through the muzzle and unloaded by pressing on an ejector. While the Kastet grenade launcher has a high degree of commonality with the GP-30, Obuvka and the 6G30 grenade launchers, it is noted for improved ergonomics, higher rate of fire, and compactness. It is reliable in service, easy to fire and can be used separately from an assault rifle or any other weapon. Simaltaneously with the RG-6 grenade launcher was being developed the single-loaded RGM grenade launcher with the use the same GP-25 barrel. The RGM "Kastet" grenade launcher is intended, above all, for the interest of the law enforcement agencies, furthermore, there are available a number of 40 mm rounds of the clearly "police" nature, for instance, the gas "Gvozd" equipped with the receipt CS. The main advantage of the RG-1 with a shoulder folded rest, is its compactness.